Zucchini noodles, or “zoodles,” are all the rage, so I hopped onto the bandwagon using my garden zucchini to make these miso meatballs over sauteed zucchini noodles! I was actually introduced to zucchini noodles a couple of years ago when I won a vegetable spiral tool machine from a Canadian lottery. I gave the prize to my brother thinking I would have no use for it (relying on my trusty knife here!) However, regrets have set in! I cannnot take it back after all this time, though, I think he would definitely share it 🙂 That aside, I have a handy hand tool that helped me with these miso meatballs over sauteed zucchini noodles. Had to do it all by hand but hey! Workout! 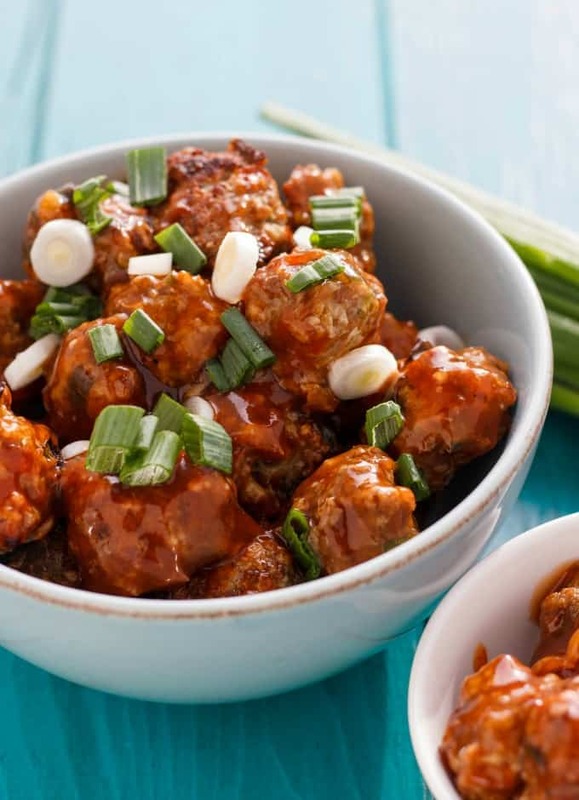 When I originally set out to make these miso meatballs, I had a couple of ideas in mind. Dan has been wanting me to make some homemade miso soup so I finally got around to buying the miso paste again. It was sitting in the fridge, calling my name along with some ground beef. Thinking back now, I wish I had some ground pork on hand, but the beef worked out well and I love the way these meatballs turned out! I was a little concerned about them being too salty seeing as miso paste is very salty, but I just made sure to limit my salt here. Another idea that came to mind when making these meatballs: including zucchini in the recipe somehow! My garden has been going crazy with zucchini and people are still giving me more!! I was starting to panic so I made a goal to not only include zucchini in the actual meatballs themselves, but serve them over zucchini! Almost like spaghetti and meatballs without the pasta 🙂 Dan was really impressed with the whole dish! Looked gourmet while remaining really simple to make. 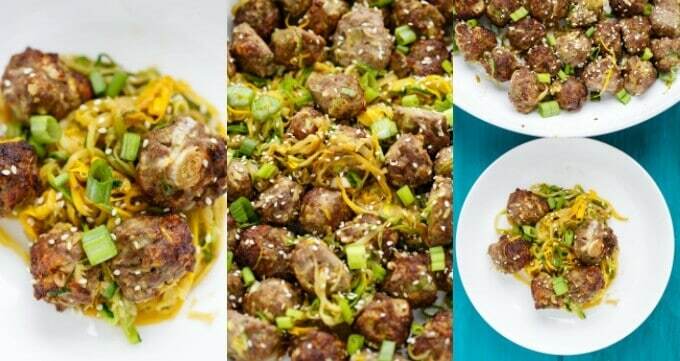 These miso meatballs over sauteed zucchini noodles may seem like a lot of work, but trust me, soooo simple, and the meatballs are baked, leaving you hands free for the remainder of the time you spend in the kitchen. I love the kitchen so no complaints here! 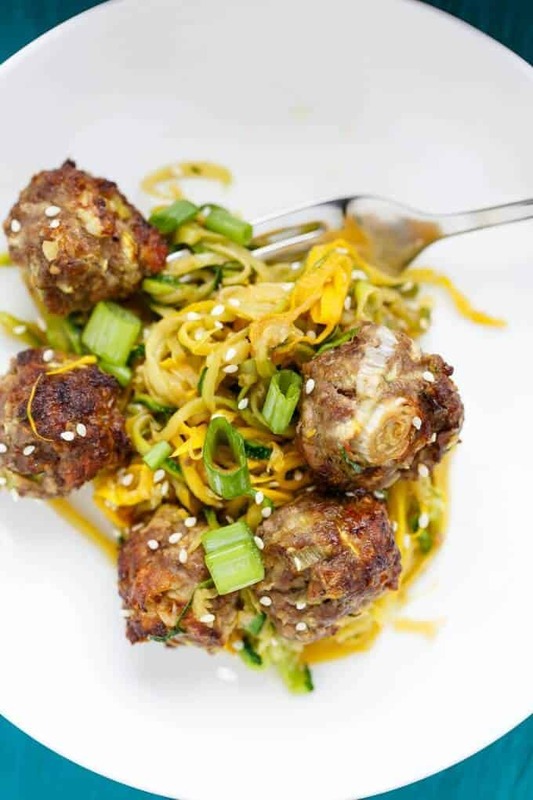 These miso and zucchini meatballs are great on their own, but over zucchini noodles you have a complete meal! Preheat oven to 400F. Line baking sheet with parchment paper or silicone mat for easy clean up. Combine all of the meatball ingredients into a large mixing bowl and mix until JUST combined. Do not overwork meat. Measure out 1 tablespoon-sized portions and roll into balls. Place onto baking sheet (will probably have to work in two batches) and bake for 20-25 minutes. Using a spiral or noodle attachment, create your zucchini noodles. My tool makes long, thin noodles. Add oil to a large frying pan over medium-high heat. When hot, add noodles and cook for 1 minute. Add garlic and cook for another minute. Stir in sauce and cook for 1 more minute. 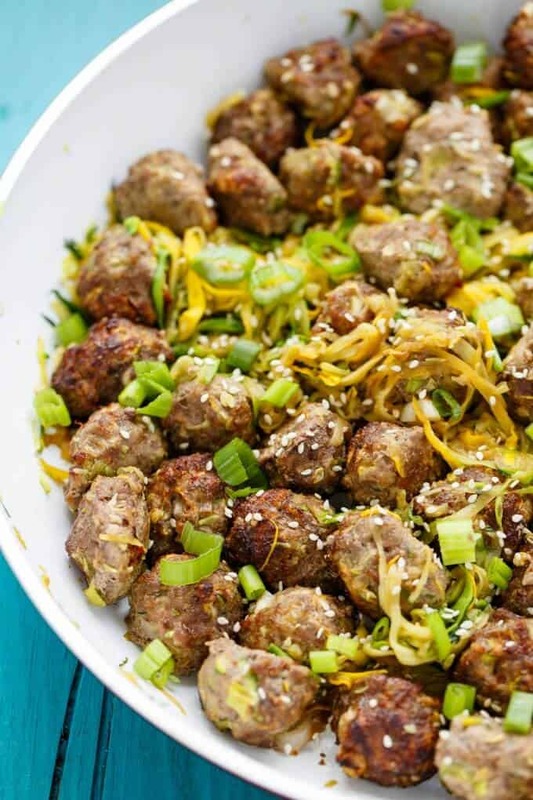 Place noodles onto plate and top with meatballs. Garnish with additional green onion and sesame seeds if desired! I guess it is time to change up the weekly recommendations! TV Show: Doctor Who. (Same as last week!) I cannot deny it, I just LOVE this show! For many years I scoffed it off because my dad said it had a horrible premise and I tend to believe him since he is my go-to sci-fi guy. How wrong he was! I am ashamed I was so easy to convince to pass over on such a great show. I even got my husband into it. Don’t ask who my favourite Doctor is because I find wonderful qualities in them all! Video Game: Stardew Valley. (Same as last week and I am STILL loving this one!) I actually just bought this game during the Steam summer sale and have over 50 hours into it! ONE person developed this game.ONE. That is insane. Totally reminiscent of Harvest Moon games. I cannot get enough of it! I think I would also prefer the zucchini noodles cooked a little and what a great combo to enjoy them with the miso meatballs!! Yum! This looks amazing and healthy! This is absolutely delicious! Loving all those meatballs! Definitely a must try! What a great combination of flavors and textures! Can't wait to give this one a try! Honestly, Cathy, this was a quick meal. Which I am glad for because it disappeared so fast! Meatballs are such a fun food, especially when served over something equally as fun as wiggly zucchini noodles! 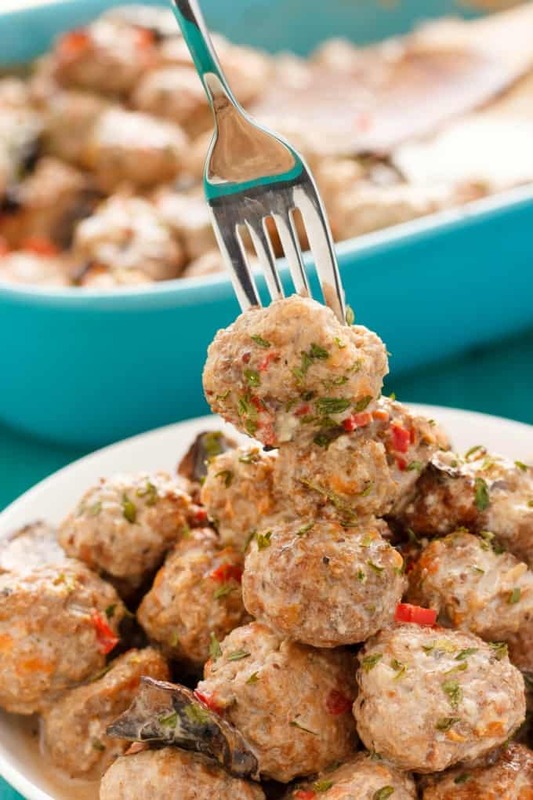 I'm a huge meatball fan and love how versatile and fun they can taste. This version is perfect and I love that it's served over zucchini noodles.